Palmitoylethanolamide (PEA) is a glial cell modulator. Glial cells are Central Nervous System cells which release many inflammatory substances that act upon neurons, amplifying pain (Watkins and Maier, 2002). With time, PEA modulates (or tones down) pain. PEA is well tolerated with no significant side effects and is very helpful for neuropathic pain, migraine, osteoarthritic pain and fibromyalgia. It is anti-inflammatory and neuroprotective. PEA can be taken simultaneously with other medication. PEA does not contain sugar, yeast, allergens, sorbitol, magnesium stearate, salicylates or other ingredients. Dosage: Take 1 capsule (300mg) daily at 8 pm for 3 days, then 1 capsule twice a day (8 am and 8 pm) for 3 days, then go up to 3 capsules a day (one at 8 am and two at 8 pm). Most people need 2 capsules twice daily (two at 8 am and two at 8 pm). Take with or soon after food, or sprinkle the contents of the capsule on your food or mix with yoghurt, etc. In the case of severe pain, migraine etc. it is recommended that the capsule is opened and the contents (PEA) placed under the tongue for a few minutes. The PEA dissolves in the mouth and is absorbed sublingually. This may enhance treatment. If there is no improvement in pain intensity after a month, the dosage may be doubled. Doses up to 16 capsules (100mg/kg body weight/day) have been proven to be safe for adults. PEA may take time to reduce pain and maximum pain reduction may take up to 3 months. Compare the effect of Palmitoylethanolamide (PEA) versus Ibuprofen, which is a nonsteroidal anti-inflammatory drug (NSAID) used for pain relief. 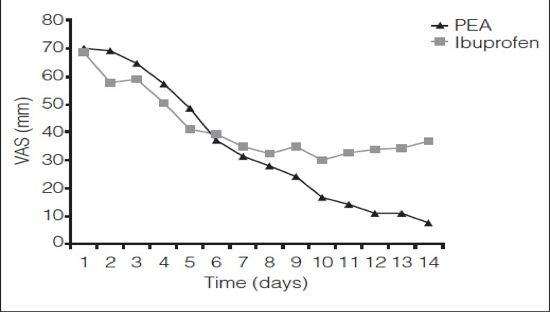 Results show pain decrease after 1 week of treatment was better with PEA than Ibuprofen. After 2 weeks of treatment, pain reduction was twice as good with PEA compared to Ibuprofen. Palmitoylethanolamide (PEA) has been demonstrated to bind to a receptor in the cell nucleus. PEA performs a great variety of biological functions related to chronic and neuropathic pain and inflammation, as demonstrated in clinical trials. These include peripheral neuropathies such as diabetic neuropathy, chemotherapy-induced peripheral neuropathy, carpal tunnel syndrome, sciatic pain, osteoarthritis, low back pain, failed back surgery syndrome, dental pains, neuropathic pain in stroke and multiple sclerosis, chronic pelvic pain, post-herpetic neuralgia, and vaginal pains. PEA has been used by over a million patients, showing the potential efficacy and safety in the treatment of various syndromes associated with chronic pain that is poorly responsive to standard therapies. It can be used synergistically with other pain treatments and has been shown to reduce the reliance on narcotic analgesics. Disclaimer: This brochure contains generic information only. For more information on PEA, please consult your medical practitioner or pharmacist.